Chile, 1974. The previous year General Pinochet had overthrown Allende’s democratically elected socialist government and seized power in a bloody coup. A brutal crackdown swiftly followed. Set in the country’s remote Andean foothills, Juan Radrigán’s Beasts (Las brutas) is based on the true story of three sisters who were found tied together at the waist and hung from a rock. At first it was not clear if they had been executed for helping fugitives from the military regime or whether this was a ritual suicide. 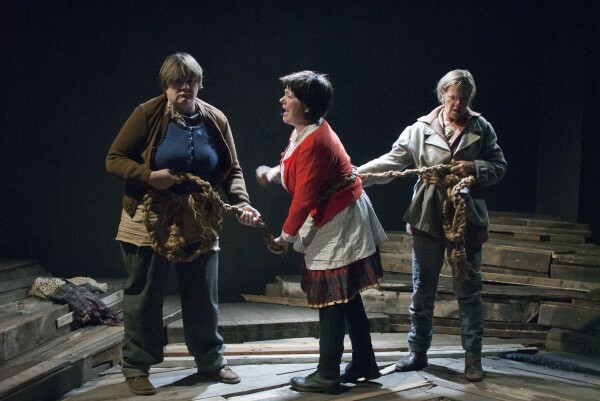 Radrigán’s evocative play (in a new English translation by Catherine Boyle) explores the devastating effects of isolation and a fear of the unknown on three women. They are sisters, the last of an indigenous Andean family, and the only life they have known is tending goats and sheep. As they bicker amongst themselves we learn of the various hardships they have endured. Justia, the eldest sister, was raped at the age of seventeen by a stranger prospecting for gold in the local mines. None of them were able to go to school, manage to put down roots or enjoy normal family lives. Instead, the three women have co-existed together, oblivious to progress and the wider world. So much so, that they cannot comprehend that in the cities there are now boxes that talk or branchless brooms that sweep or that you can capture “a piece of sun in a glass jar”. All they know for certain is that they have found it increasingly difficult to barter their goods and there’s no longer anyone around to buy their goat’s cheese. It is only when travelling salesman, Don Javier (a great cameo from Sean O’ Callaghan) arrives with his suitcase of second-hand clothes that they learn of the recent events that have caused their neighbours to sell their stock and move to the cities. Wild rumours, hinting at political unrest and horrors to come, have caused the mass exodus. The sisters have been left behind, they realise, like animals. Tired, weak, prone to illness and fearing the changes that will come from outside (over which they have no control) they decide that it’s finally time to move on. Carolyn Pickles and Claire Cogan give excellent performances as Justia and Lucia respectively. They vividly capture a sense of lives worn down by endless toil and deprivation; Anne Marie Cavanah is slightly less convincing as the younger, more naïve sister, Luciana. The best moments, when they all shine, come with the arrival of the cavalier Don Javier. Sue Dunderdale’s direction is assured, although the pacing of production is sluggish in places. Lorna Ritchie’s set effectively conveys the dilapidated mountain shack that contains so much of their world, but there are times where the production seems wary of stillness; there’s an awful lot of scrubbing of floors, fiddling around with water jugs and mending broken wooden boards. This can prove distracting from the power of Radrigán’s words and imagery (it’s no surprise to learn that he is also a poet) and sometimes weakens the impact of an essentially powerful play about the marginalised struggling to survive against the odds.